Long-serving wing Ed Dawson and Tonga international Sami Fisilau are among five Jersey players to sign new deals. 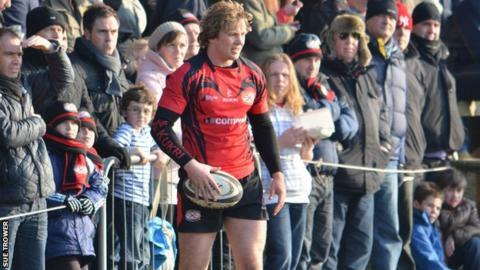 Front row forward Nick Selway, scrum-half Joel Dudley and Gary Graham, who only recently joined, will also stay with the Channel Islands club. It brings head coach Harvey Biljon's squad up to 29 as they prepare for another season in the Championship. "I'm very pleased to have further pieces in the jigsaw confirmed for next season," Biljon told the club website. "Ed is one of the longest-serving members of the squad and I expect him to push hard for selection against some of our new signings." Biljon has already added nine players to his squad for next season, including the signing of England Under-20 wing Tom Howe on loan from Wasps. "Sami has made a real impact already, while Gary was unfortunate to pick up a shoulder injury after a few matches, but he's coming back to fitness and will be challenging for game-time once we get onto the field for our pre-season matches." "There are a handful of other signings in the pipeline and I hope the remaining players will be confirmed soon." Saturday's Siam Cup match marks the end of the season for Jersey and Channel Island rivals Guernsey, who will be competing for the trophy for the 75th time.